We have a challenge before us! I am delighted to share with you an amazing opportunity for Westminster School — a game-changing challenge from an astonishingly generous anonymous donor. 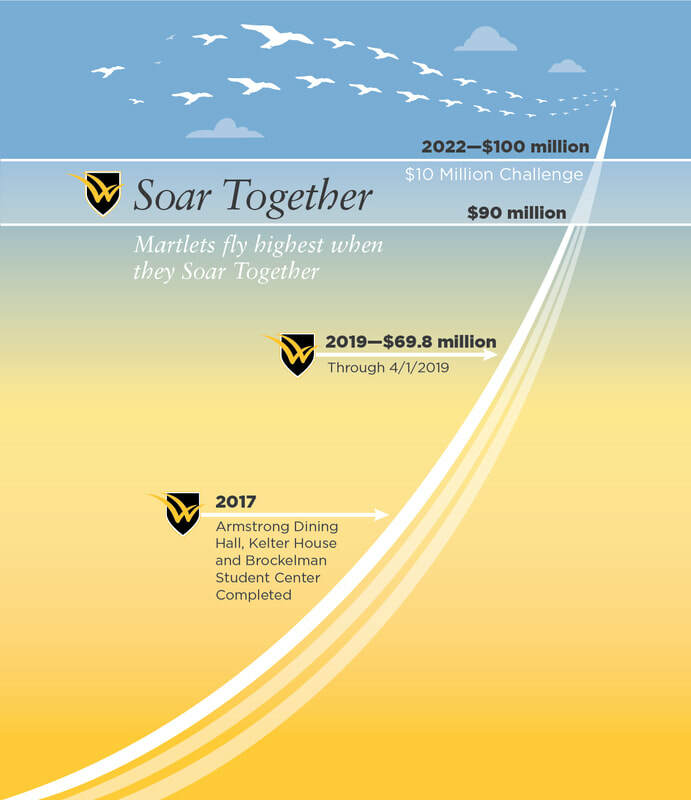 Our challenge donor promises a $10 million gift dedicated to student financial aid if our Soar Together Campaign for Westminster School reaches $90 million by 2022. This endowment gift would provide $500,000 of support for talented students every year. That is an average of 10 scholarships each year, forever. Truly incredible! Westminster competes successfully with the best schools in the country — such as Choate, Hotchkiss, and Taft — for students, for faculty, and for Founders League Championships. In all that we do, we seek to enhance the experience of our students in a diverse, sustainable school community. But, we fall short in support for financial aid, for faculty, and for programs, which is why this challenge is so inspiring. Already the most successful campaign in our school’s history thanks to your generosity, the Soar Together Campaign was at $66 million before the challenge. The campaign’s momentum remains strong. In fact, we raised $8 million just in the last year. With your help, we know that we can meet this challenge. The Board of Trustees embraced this challenge unanimously and enthusiastically, with two trustees immediately committing additional $1 million gifts. Alumni, if you feel that Westminster made a difference for you and you seek to give back, now is the time to stretch for Westminster. Parents, if Westminster made a difference for your children and you wish to give back, now is the time to stretch for Westminster. We hope you will join us in meeting this remarkable challenge. We are at a truly extraordinary point in Westminster’s history. Martlets Fly Together. Together Martlets Soar! Already the most successful campaign in our school’s history thanks to your generosity, the Soar Together Campaign has raised $69.8 million through 4/1/2019. To discuss a capital gift, please contact Newell Grant ’99, Director of Advancement, at (860) 408-3058 or ngrant@westminster-school.org. All gifts and pledges to The Westminster Fund are included in the Soar Together Campaign. These current-use funds provide vital support for students, faculty and programs at the school. Please click the button below to make a gift. Martlets fly highest when they Soar Together. Your support of the Soar Together campaign makes an everlasting impact on the quality of life and education on Williams Hill. Please contact Newell Grant ’99, Director of Advancement, at (860) 408-3058 or ngrant@westminster-school.org.